I remember traveling as a small child identify “characters” that were made as the vine grew over trees, buildings, powerlines and anything that was in one place for a period of time. Can you see the giraffe below? 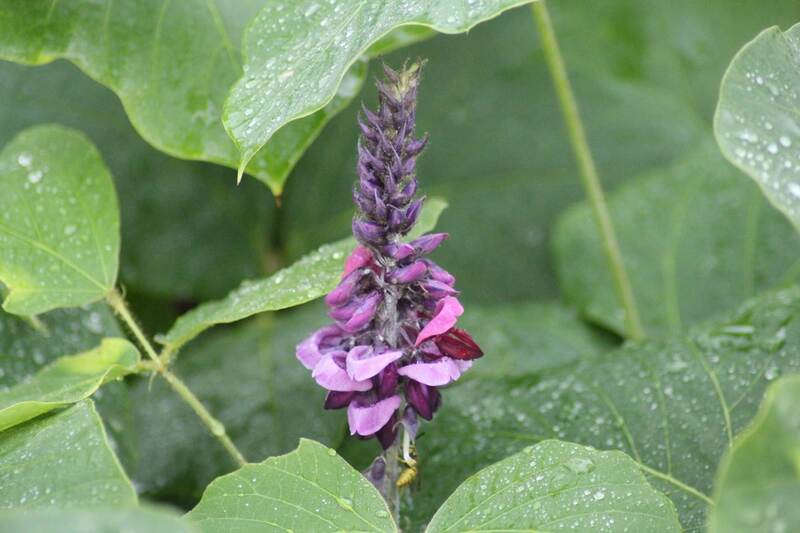 Kudzu (Pueraria montana) was introduced to the United States in 1876 at the Philadelphia Exposition. In the 1930s it was widely planted for erosion control. At that same time it became popular as a forage crop. There are estimates that 300,000 acres of kudzu was planted by the 1940s. Now, it is so aggressive, it can cover buildings, barns, houses, and parked vehicles. It covers trees and power lines, often breaking them with the sure weight of the plant/vine.The perennial trailing vine can grow up to 1’ a day and nearly 100’ in a single season depending upon its location. One single crown can produce as many as 30 new vines that expand out in all directions. Kudzu is extremely difficult to control once established. Kudzu is so aggressive it covers and smothers all other plants in its path resulting in solid stands that can eliminate native species. In some locations, it can appear as a sea of kudzu as far as the eye can see. While this plant is well established in areas to our south, kudzu is here in Ohio, and handling our harsher winters amazing fine. The vine continues to creep up from the south. Several years ago, a find of kudzu was discovered in Cleveland. Occasionally we will receive reports from other outlier areas across the buckeye state, but encourage everyone to be looking for this invasive species. The leaves of kudzu are compound with three leaflets that can span up to 7". The purple flowers are between 2 - 12", are similar to the flowers set by the pea plant, and have a slight grape-like fragrance. The fruit, which is set in the late summer through fall, is flat and covered with fine yellowish hairs. Each pod can have between 3 - 10 seeds. The young vines will also be covered with hairs. The main method of natural spread is by stolons or runners, although seeds can also play a part. Humans serve as a means of unnatural spread unfortunately. If you see kudzu, or something that you suspect is kudzu, be sure to report it either by using the GLEDN app (http://gledn.osu.edu), or contacting your local Extension office.